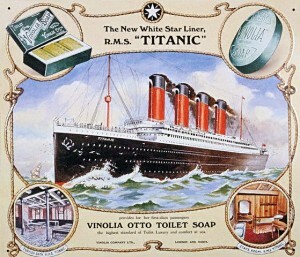 1 April-Titanic’s sea trials postponed by bad weather. 2 April- 0600: Sea trials begin. Fire in boiler room six coal hold. 2000 (8.00 p.m.): Trials completed; Titanic returns to Southampton. 4 April-Titanic berths at Southampton around midnight. 10 April-Titanic departs Southampton at 12 noon. While departing,suction from propellers causes New York to break moorings.Collision is averted by tugs and extra speed from Titanic. 17:30 (5:30 p.m.): Arrival at Cherbourg, France. 274 passengers board including John Jacob Astor.22 passengers disembark. 20:30 (8:30 p.m.): Departs Cherbourg for Queenstown,(Cobh), Ireland. (later Father Brown, SJ) with his camera and photos of life aboard ship. 13:30 (1:30 p.m.). Titanic departs Queenstown bound for New York with 2,206 passengers and crew. 12 April-Titanic travels 326 miles. 1. The Titanic Museum at Pigeon Forge has announced the first ever Titanic Author’s Week from 1 April-7 April 2013. Each day between 10 A.M.-7P.M. noted Titanic authors will be available to converse with the public about their Titanic books. Each author will have their own tented reception area. The event is free and photos with the authors will be allowed. Books purchased at the event comes with a discount in the admission price to the Titanic Museum. For further information and authors scheduled to attend, go to www.titanicattraction.com. 2. Cobh (Queenstown when Titanic made her last stop in 1912) is looking to develop its Titanic connection as well as to Lusitania. The proposed programme will tie in other Titanic commemorations that are held at Titanic Experience, the Cobh Museum, and Cobh Heritage Centre. *We no longer provide links to Republic of Ireland newspapers in protest to demanding payments for links. Much is being done to make ready for the Titanic remembrance ceremonies in April. Just about everything is being scrubbed, built, or shined up for the event. Except it seemsa pier in Cobh (formerly Queenstown) where 123 passengers boarded tenders for Titanic. The old pier is a serious state of decay reports Irish Times and in danger of collapsing. The Times reports that there is some uncertainty as to who owns the pier, which has led to no money funding its renovation. The nearby former White Star Line office has been renovated and a visitor attraction. 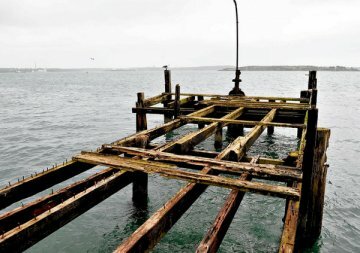 The city has no funding available and the pier is not on any protected structures list. Some effort is underway to seek funding. Otherwise visitors will see a decaying pier where only seagulls perch looking at the tourists for possible snacks to feed on.